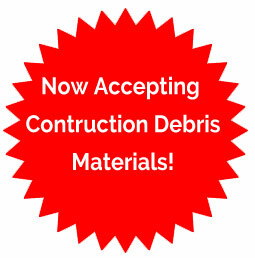 Sarnago and Sons now accepting construction debris materials at our Clearwater location! At Sarnago & Sons, we take pride in providing dumpster rental service that is timely and affordable. We can deliver a dumpster within 24 hours of being contacted. Our roll off dumpsters are perfect for large, residential cleanup, trash removal projects, yard waste, landscaping projects and construction waste removal. We also specialize in providing dumpsters for concrete removal and recycling. Whether you’re a homeowner that needs to rent a dumpster for the first time, or a contractor that rents several dumpsters a month, we’ll provide our big red box at a great price and fast, efficient service. With us, there are no hidden dumpster rental fees – just one flat rate to get the dumpster to your site, hauled away, and disposed of! Our dumpster service agreement provides you with a dumpster at your home, business, or job site for 15 days! We also have 30 day dumpster service agreements available. Remember, there are zero hoops to jump through with our roll off service. Our service agreement is just as easy as walking into one of our dumpsters. That’s right; all of our big red boxes open on one end and can be walked into! This eliminates the need to lift anything over the sides of any of our roll off dumpsters. We strive in every way to make your dumpster rental as easy as possible. Our roll-off dumpster rentals range from 10 to 50 yards and we service the majority of the Tampa Bay area. All of Pinellas, Pasco, Hillsborough, Hernando and Sarasota counties. That’s as far north as Brooksville, as far East as Plant City, and as far South as Sarasota! We are located in Clearwater, in the heart of Pinellas County. Our 10 yard trash / construction dumpster in unincorporated Pinellas County is only $316! Those cities include Belleair, Belleair Bluffs, Crystal Beach, Dunedin, Eastlake, Gulfport, Indian Rocks Beach, Largo, Maderia Beach, Oldsmar, Palm Harbor, Pinellas Park, Reddington Beach, Safety Harbor, Seminole, Tarpon Springs, Tierra Verde, and Treasure Island. Remember there are zero hoops to jump through with us. 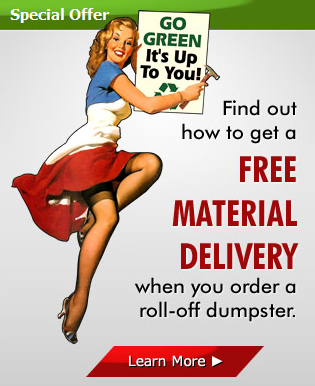 In addition to our dumpsters, we also provide a wide range of materials. We have fill dirt, pipe bedding, gravel, clean masonry sand, paver base, and road base for sale. Use these materials to complete your next project, and accent it nicely. Don’t wait around for your trash or recycling to get picked up. Often it can be an eyesore on an otherwise pristine property. We are capable of hauling all types of waste, including: asphalt, concrete, commercial trash, stumps, brush, and demolition waste! 10 or 20 yard dumpsters for concrete in Crystal Beach, Dunedin, Eastlake, Oldsmar, Palm Harbor and Safety Harbor for a flat $155 rate! Call now and get your big red box delivered today! You’re not in direct contact with the actual delivery company. This can often result in poor service or confusion. It will cost you more. Brokers usually charge a higher price so they can take a cut and still pass on the local service providers. With Sarnago and Sons, we cut out the middleman, and afford you the dumpster you need at a price that works within your budget. Avoid the hassle of a 3rd party broker, and deal directly with us – a family-owned business that’s been around for nearly 40 years and counting.